photo by by Tara Walker Steve Hamilton gets blood drawn in a room full of volunteers and patients at 9 Health Fair in Granby on April 7. Kremmling will have a health fair on April 28. 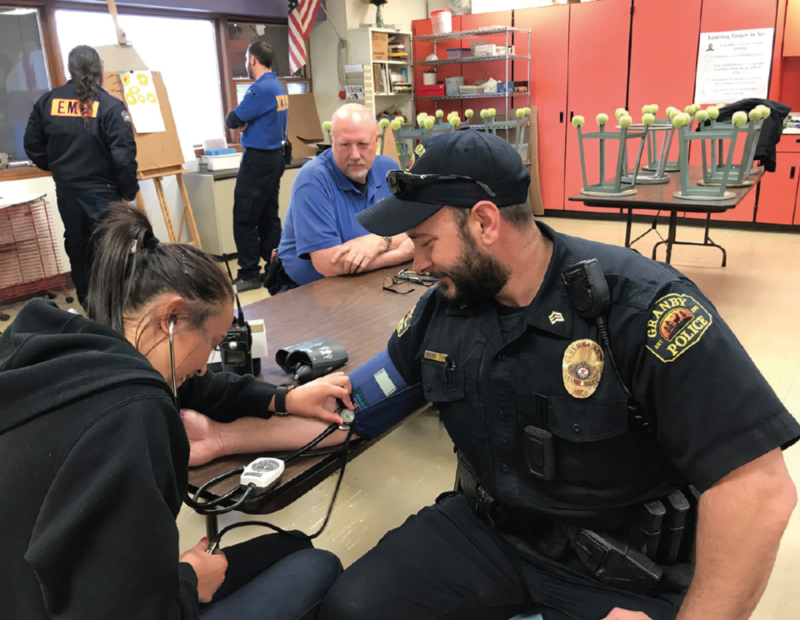 Despite rainy weather during spring break, The April 7th 9 Health Fair in Granby had a good turnout and served 393 patients compared to last year’s number of approximately 450. Chief Ray Jennings thanked Tim Showalter and the Rotary. Jennings explained that the Granby Rotary is the community organization that is the lead for the fair while Grand County EMS and government assists with medical volunteers. Chief Jennings thanked volunteers from East Grand Community Clinic (Denver Health), Kremmling Hospital District, Middle Park Medical Center, retired nurses, and Grand County public health nurses and the many other volunteers that assisted to make the event a success. Tim Showalter was the Rotary representative and organizer of the event. He explained that Granby Rotary is about service above self. The Granby Health Fair is their biggest community project with members of Rotary helping with the event for the past 20 plus years. Around 30 rotary members and spouses helped this year. Showalter noted that there are three health fairs in the County every year. The Fraser River Valley Lions Club organizes the Winter Park Health Fair and the Middle Park Medical Center’s health fair in Kremmling is upcoming. EMS program. Doug Wittrock of the Grand County EMS looks on. Middle Park Medical Center will hold its 2nd Annual Health Fair on Saturday, April 28, 2018 from 7:30-11:30 am at West Grand High School, 208 12th Street, Kremmling. Discounted health and wellness blood screenings will be offered the week before the fair and at the fair itself. Those getting blood screenings beforehand can receive their results while at the fair. Other screenings available include: blood pressure, pulse oximetry, height and weight, diabetes risk management and nutrition, skin checks, stress management, cardiac risk assessment, fall prevention, vision screening. The Flight for Life helicopter will be present to entertain the kids, as well as other interactive activities.